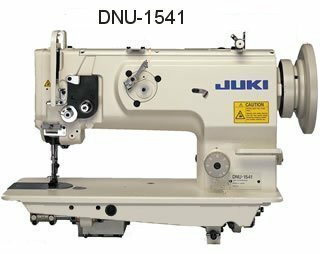 JUKI DNU-1541 With Knockdown Servo Stand"
JUKI DNU-1541 1-needle, Unison-feed, Lockstitch Machine with Large Hook and Reverse Stitching. With Knockdown Stand" (assembly required) . Servo Motor Included. The machine's enhanced features include a clear view of the area around the needle, placement of the bobbin thread winder on the front face of the machine arm, and a large handwheel(160mm). A knee-lifter mechanism is built in the bed. This reduces the pressure required to operate the knee-lifter and facilitates setup.The machine’s full-open-type top design makes adjusting works easier.The machine comes with a lubricating mechanism that uses a centralized oil wick. This substantially reduces the time and trouble required for oiling the machine. (Hook : automatic. )A walking foot mechanism is built into the machine arm to prevent oil from scattering. The machine delivers increased productivity at sewing speeds as high as 2,500rp.